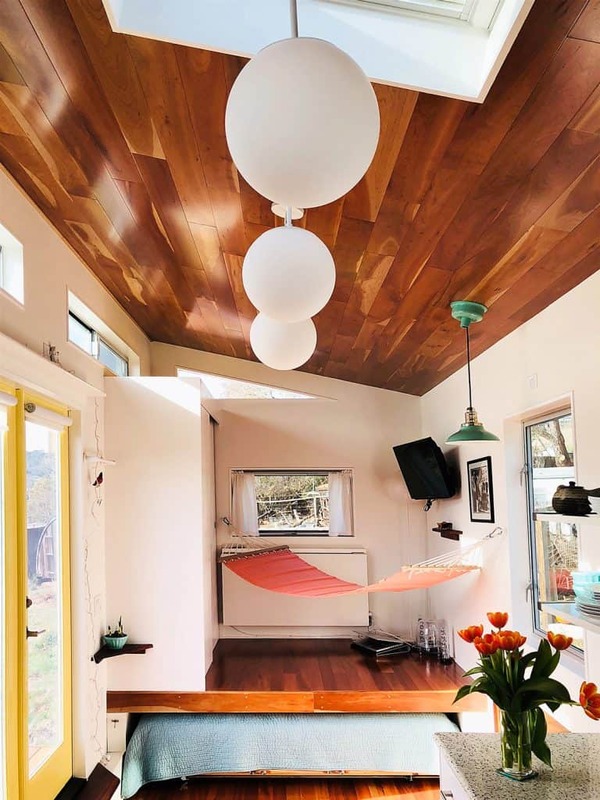 Years ago, Pauline Sugarman came to see the Tiny Project house when I was living in Sebastopol, CA. Since then we’ve stayed in touch and I’ve visited her house a couple times while under construction, offering any advise I could along her design/build journey. Pauline has been very private about her process until now, but the time has now come when her house is near complete and she’s ready to share it with the world. She doesn’t have her own blog or website, so I’ve asked her if I can share her photos and story myself. She’s named her house Hale Lehuanani, which in Hawaiian means “House of the Beautiful ōhiʻa Flower”. 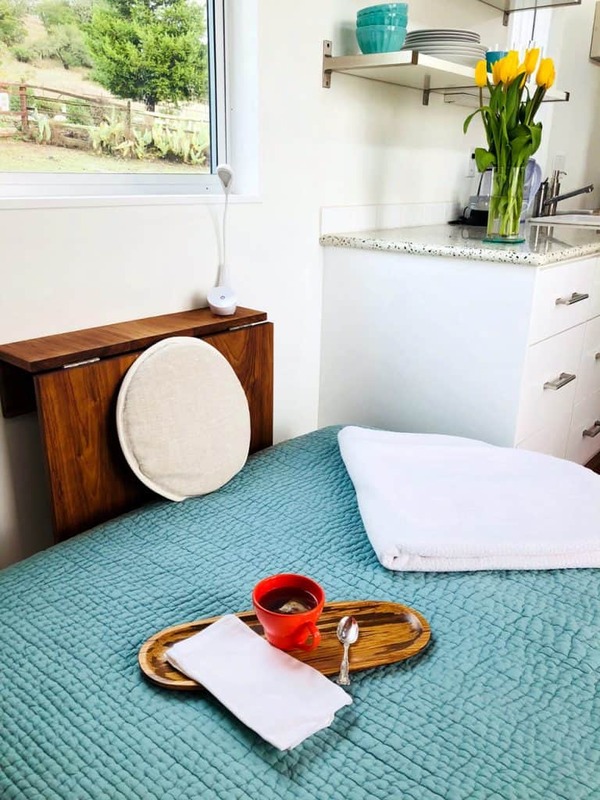 It’s a stunningly beautiful house with lots of light, bright white walls accented by gorgeous rich wood, lots of high-end materials — all with a clean, contemporary design. And she did most all the work herself! I could not be more proud of her and I think her story and her house are truly inspirational. Below is a brief interview with Pauline about her experience designing and building her tiny house on wheels, along with many photos of the completed house and the construction process. A full photo gallery can be found at the bottom. Please enjoy! What inspired you to build a tiny house on wheels? I was living in Marin County just north of San Francisco. And the rents just kept going up and I was getting pushed farther away from where I worked and wanted to live. The commute was brutal. I woke up one night and realized that a tiny house on wheels would be a great solution. And once I decided that I became obsessed. What steps did you follow to build your tiny house? I had always wanted to design buildings. And learn to build. So I knew I wanted to do all phases. My first step was inspiration and I started by looking at YouTube videos and books of small spaces and just being honest with myself about what I needed in a home and what I liked in design. Andrew Morrison’s tiny house “hOMe” on YouTube was a great inspiration. And coming to see your tiny house (the Tiny Project tiny house) was an eye opener in terms of seeing the beauty that was possible in a tiny house. I gathered as many details as possible (measurements for everything) then laid out the tiny house on graph paper, then drew with chalk on the road. When I saw it in chalk in real size it really helped me visualize what was working and what I needed to change. I then created a Google Sketchup 3d design (using tiny house SketchUp tutorials on YouTube) and lastly a foam model. From there I found a tiny house builder to help me create the framing plans. And Gary Bute of Tiny House Systems (unfortunately no longer in business, as Gary has retired) helped me with plumbing and electrical plans. 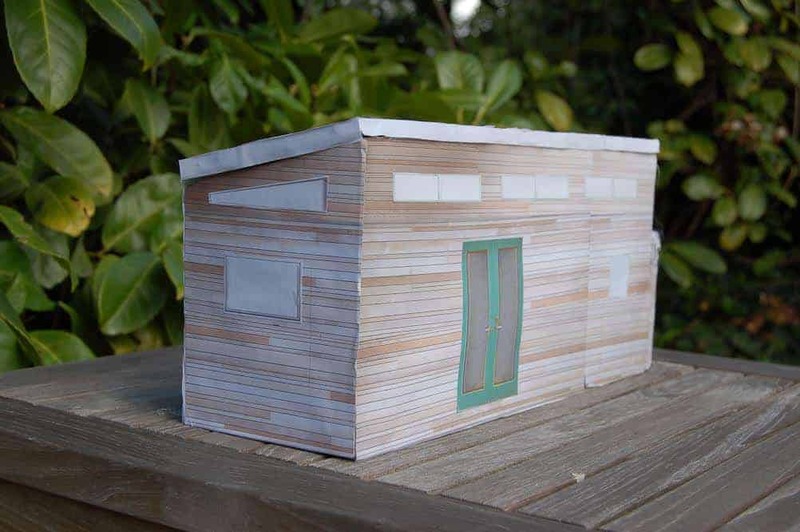 I also took tiny house workshops, read tiny house blogs and studied books/watched videos on building tiny houses. 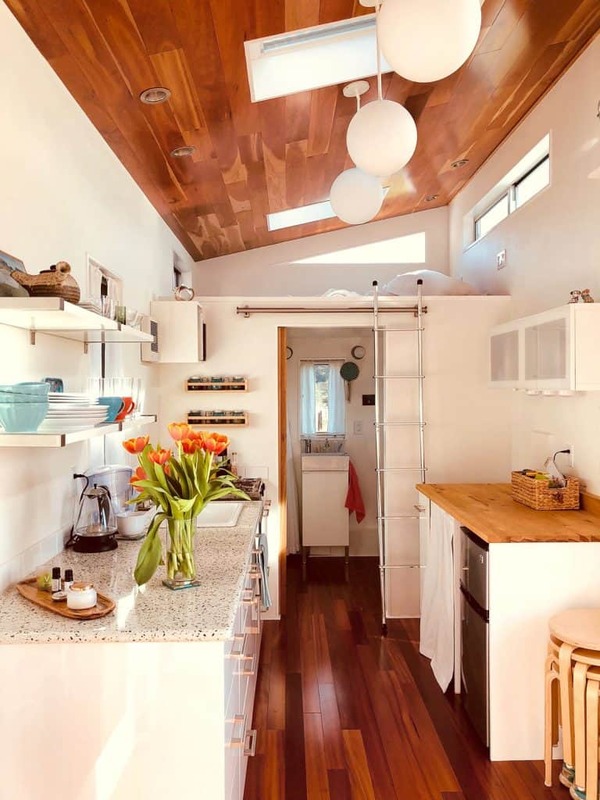 Tiny houses on wheels have specific building requirements to withstand winds on the road, for insulation, moisture, balance and for being connected properly to the trailer. I highly recommend Dee Williams’ “Go House Go” who did a tremendous amount of research and Andrew Morrison DVD set on building a tiny houses. Did you have any building experience? No. Absolutely none. But I was determined to learn. 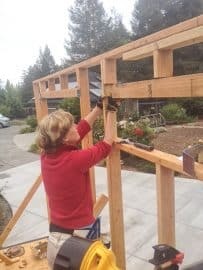 I kept interviewing builders until I found one (with lots of patience) who had built tiny houses that was open to working side by side and teaching me as we built. And I hired professionals such as a finish carpenter and an electrician to help with some of the more specialized work. What was the main challenge for you in building your tiny house? As women in my late 50’s I thought it might be my strength. I was working long days and then doing the building on my days off. But I just took very good care of myself, eating right and resting and my body, though exhausted at times, did great. The real challenge was working, at times, with men in the construction world. Not all, but some thought, as a woman, they could take advantage of me in different ways. I just persisted in seeking out respectful, quality workers and found great help in the end. Have you completed the build and found a place to park it? Yes, I completed the house last year but I call it my “maker space” as I continue to work on projects (deck, curtains, hammock) so it is starting to really feel like a home. And yes, it is parked. It took a while but I ended up finding a great space just outside the city limits with an amazing family who love tiny houses. Any last thoughts on the tiny house building process? 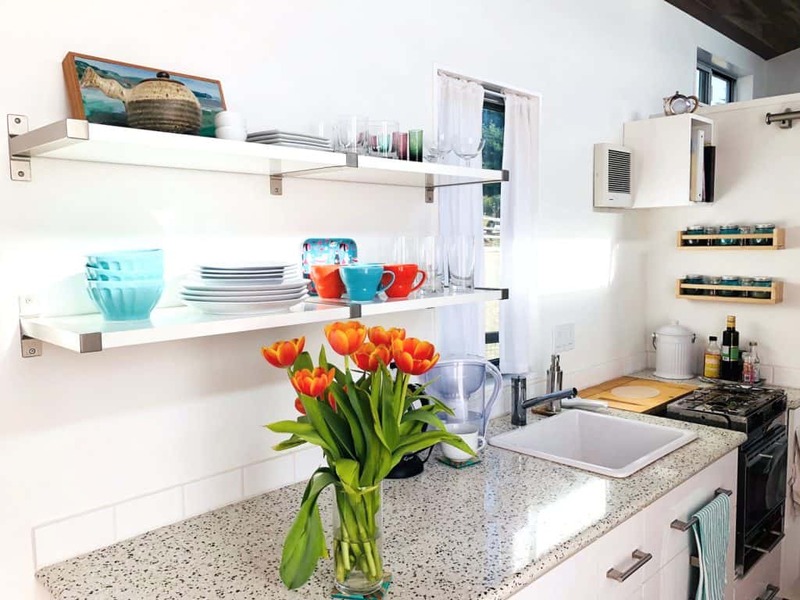 Just that, if I can do it, a women in my last 50s with NO building experience, anyone out there thinking of building a tiny house – if you are determined enough, you can do it! 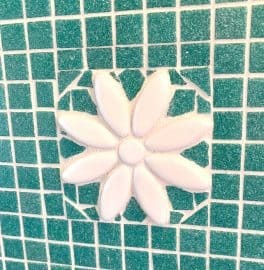 Above: Several of the beautiful and unique details of Pauline’s house such as the custom shower tiling, and hand-made small shelving in the bathroom and living areas. House Dimensions: My house is 26′ long and legal 8’5″ wide. With the loft it gives me 220 sf. It is a shed roof with highest a little under 13′-5″. Trailer: Iron Eagle Tiny House Trailer (out of Oregon – highly recommend) 26′ trailer with a special built steel bar over tongue that can take 1,000 lbs of weight (for my shed to hold my equipment including solar batteries to come). Has 6 jacks and a 22 Gauge Gauge Galvanized Sheet on the Bottom for Flashing. The 6 jacks made it very easy to level before starting the build. Once leveled that trailer stayed level the entire time. Very impressed. Also has 3-5,000 lb (5k) axles for total of 15,000 lb weight limit. The trailer itself weighs 2,500 lb so that left me 12,500 lbs. Now I understand you can request 7k axles so a person could get 2 axles and carry 14,000 lbs. Framing: I went with 18″ on center (o.c.) floor joists which is supposed to help stop any floor creaking and 24 o.c. 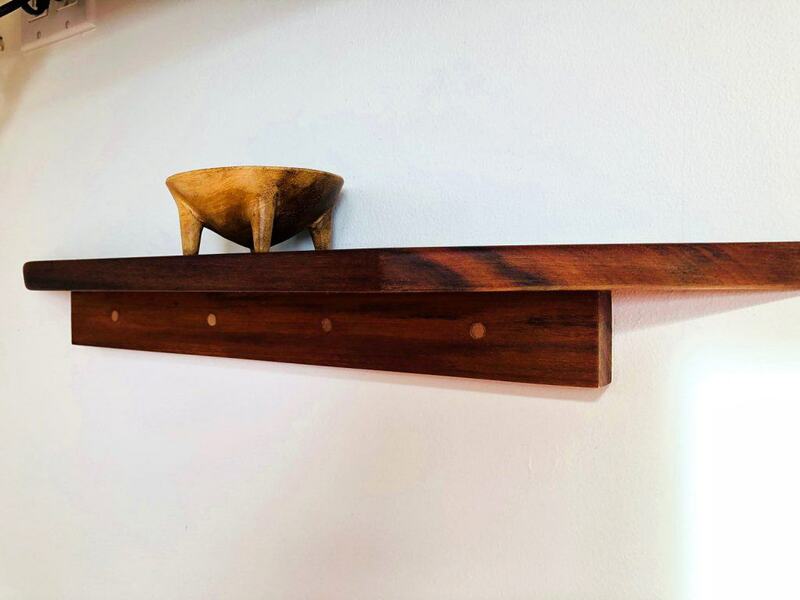 for the walls/roof rafters. Materials: Siding is FSC certified redwood tongue and groove (T&G) with eased edge and roof is metal. Windows are Milgard Aluminum with thermal break. (I love the look but these ended up having lots of issues and Milgard was very poor with customer service. I would not recommend their aluminum windows to anyone. Interior: I knew some of my finishes would be a bit heavy for a tiny house but I really wanted a few of the finishes (hence the 15k trailer!). 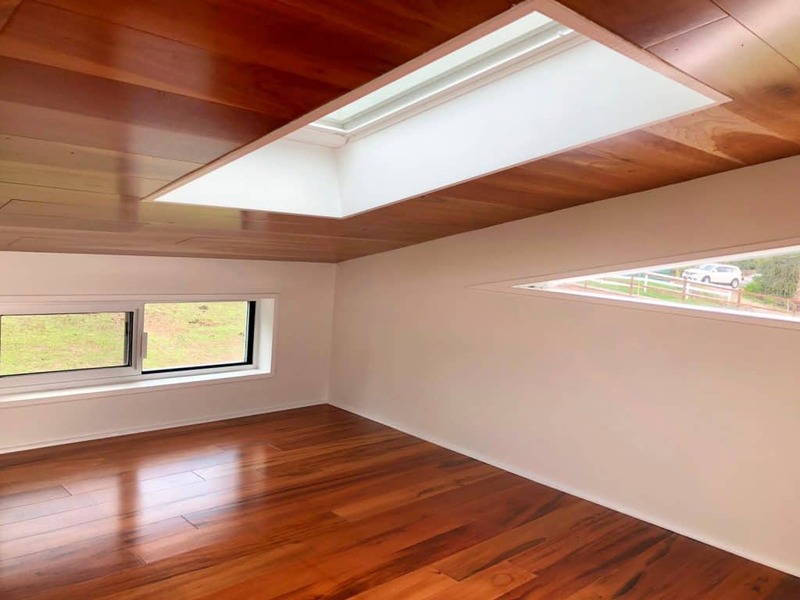 Ceiling is American Cherry hardwood. Floor is engineered Brazilian Koa (love the look but wish I had gone with hardwood so I could refinish when needed as this flooring dents easily!) Counter top is recycled glass on one side and Birch wood from Ikea on the other. For interior walls I chose 3/8″ Birch plywood. Framing Wood: I used FSC certified kiln dried instead of green wood to minimize more warping and shrinkage. Sheathing: mostly 3/4″ on the subfloor and 1/2″ plywood for walls and roof though the shed wall, over my tongue where I put my equipment, was 3/4″ in order to have something more to secure to. I love this! And I love that she found a place to park it. I also live in Marin county on a sailboat and rents are exhorbitant! Do you know if she’s still in Marin? She’s either in Marin or Southern Sonoma Co. Not completely sure where she’s parked. Absolutely lovely and well thought out. I cant think of anything I’d change. Congratulations! Hi Pauline: I read your tiny hours article. It was really good and I will show it to Mom. I am surprised they didn’t show pictures of how you handled the plumbing, waste recylcing etc. 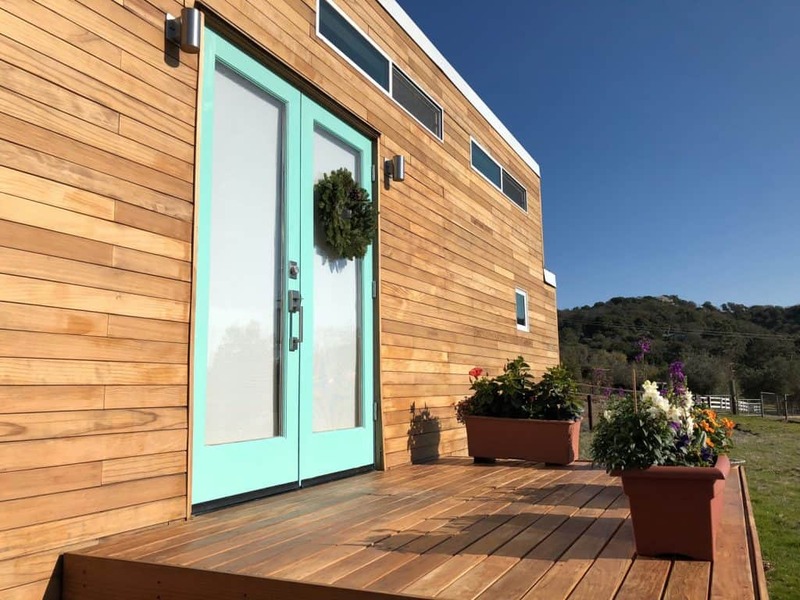 and how that works with your garden – since that is pretty fascinating and important to people going the tiny house route. Maybe they did the article in the winter when the garden wasn’t growing. Great pictures. What a marvelous story and great article! I wish she had documented her journey more to share with others, because these kind of personal achievements are what awakens the viewing public to be more motivated, positive, and inspiring themselves.